A small group of students joined Professor Dan Smith at Vyne Bar for a conversation about his research, the essential need for the Management specialization, and ways to use classroom experiences to strengthen their current or future role as a manager. Before Fall registration opened, few current Wagner students met with the WMLO Board, a team of second-year Management students, who addressed some of the academic questions students had regarding course selection and also shared information about the registration process for outside Wagner classes.This event was meant to help current students select appropriate classes and get important tips that would best develop their management skills. 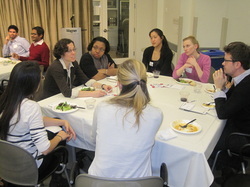 WMLO co-sponsored a fundraising event with the NYU Wagner Alumni in Fundraising group on Tuesday, April 19 – a panel discussion with fundraising and philanthropy professionals about how their respective work is going in the “recovering” economy. Current Wagner students attended the event and benefited from this networking and educational opportunity. The panelists for the event were: Margaret Coady from the Committee Encouraging Corporate Philanthropy, Lakeisha Hudson from The New York Women’s Foundation and Sandra Toussaint-Burgher from Count Me In for Women’s Economic Independence. Donate Your Gently Used Professional Clothing Items to Dress for Success! WMLO partnered with WWC to launch a clothing drive for Dress for Success on Wednesday, March 2nd. A bin was kept in the 2nd floor lobby of Puck for students to drop off any gently used business clothing, shoes, or accessories. Dress for Success provided these items to disadvantaged women returning to or entering the workforce. The drive lasted through mid-April and students generously donated items for this great cause! OCS and WMLO presented a workshop on basic salary negotiation strategies, including managing salary requests, determining student's salary requirements, and negotiating compensation package. Participants were engage in a series of group activities to practice the skills and techniques covered to help students be better prepared for the job market. WMLO partnered with Wagner Intersectionality Studies is Essential (WISE) for a potluck discussion focusing on the current issues being faced by public service managers. Current incoming students got an opportunity to meet and network with WMLO Board members. They learned about the ways in which students can get involved with the organization and participate in WMLO's activities. WMLO provided a platform for current part-time student, looking to attend more meaningful Wagner events and meet other like-minded colleagues, to come together and share their interests. The part-time students took part in this WMLO focus group, and learned more about the management topics and events that mattered most to them. This event was a great opportunity for professors from across Wagner specializations to discuss their recent academic research endeavors, methodologies, and challenges with students and the impact their research has had on public service. The dinner was opened by Dean Schall. Professors in attendance included Professor Ingrid Ellen, Professor Erica Foldy, Professor Amit Nigam, Professor Katherine O'Regan, Professor Sonia Ospina, Professor Shanna Rose, and Professor Dan Smith. Students also discussed their research interests. The WMLO board held a successful general meeting on Friday February 4th. Board members presented WMLO's goals, activities and ways to get involved. New and returning students were provided an opportunity to share past management experiences. Jersey Conference Room, Puck Building, 2nd floor, 295 Lafayette St.
WMLO held its inaugural kick-off event on Wednesday September 22nd in order for new and returning students to learn about our goals, exciting Fall events, and ways to get involved with the organization. Conference Room, Puck Building, 2nd floor, 295 Lafayette St.
How can you foster and manage change in an organization? The "Learning Organization Model" is a way to nurture collaboration and transform thinking. NYU Wagner’s Professor Erica Foldy led an interactive workshop to demonstrate how the model has affected the nonprofit and public sectors. The WMLO Board held the first of two Fall Open Board Meetings to allow interested students to participate in discussions and help shape the direction of WMLO’s Spring agenda. Student Project Room, Puck Building, 2nd floor, 295 Lafayette St.
Spring 2011 registration started on Monday, November 15th! Before Spring registration opens, the WMLO Board, a team of second-year Management students, provided answers to academic questions to help steer students in the right direction as they selected courses to best develop management skills. If you have any questions regarding a specific course, the management specialization, professors, requirements or the registration process, please stop by and get your questions answered. Not sure what Wagner classes to take next semester? Specializing in management and debating which professor to take for a certain course? Before spring registration begins, get the skinny on management courses and professors from seasoned management students so that you can make the most of your academic experience and take classes that will best develop your management skills. The WMLO Board also shared words of wisdom from the WMLO Faculty Advisors. Lafayette Conference Room, Puck Building, 2nd floor, 295 Lafayette St. The WMLO Board held its second Fall Open Board Meeting to allow interested students to participate in discussions and help shape the direction of WMLO’s Spring agenda.